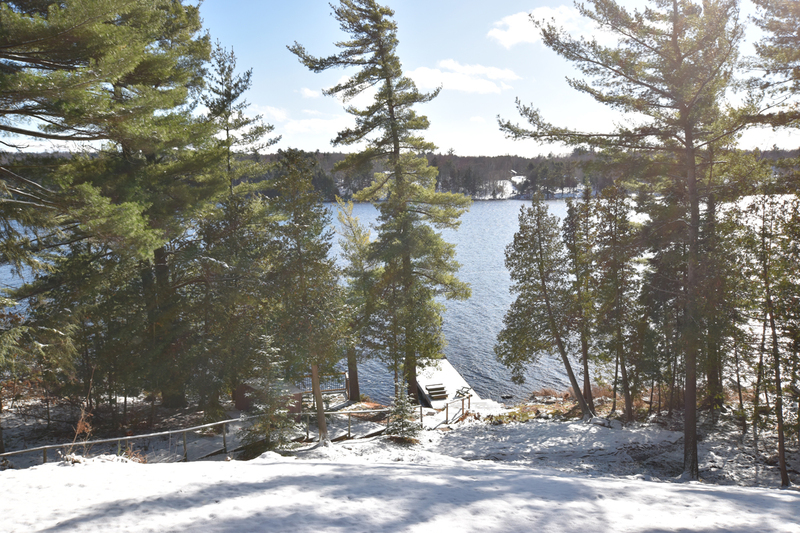 Located on popular Fairy Lake, within minutes of downtown Huntsville, this spacious, air-conditioned, five bedroom, three bathroom cottage offers in-town convenience and privacy on a large lot in a cottage setting. 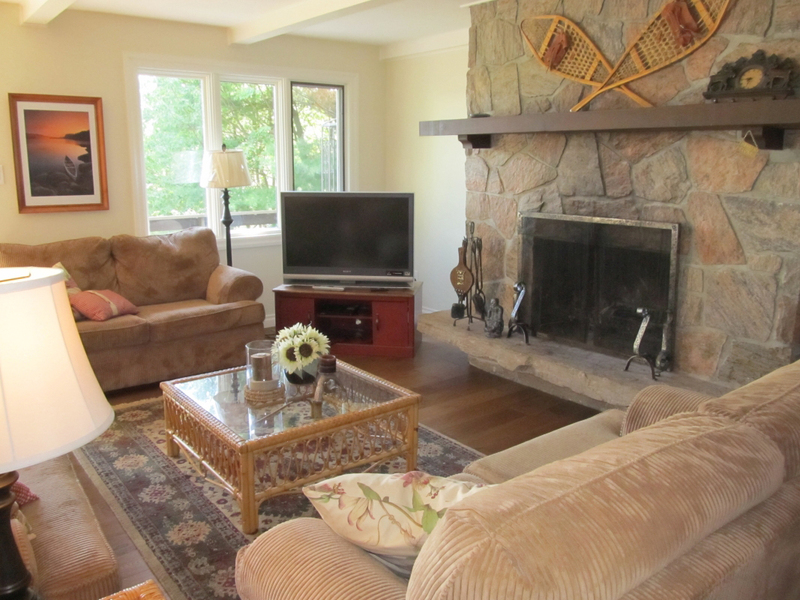 The bright, open-concept main floor has a large living room area with stone fireplace and satellite television. 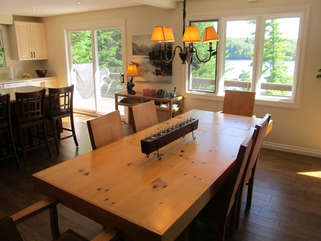 The adjacent dining area has a grand harvest table, seating for eight and a great view of the lake. 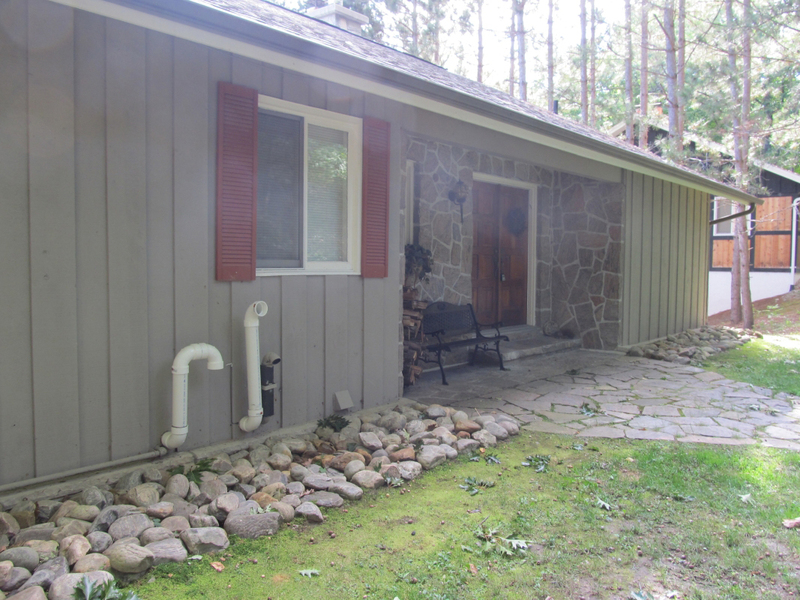 Sliding glass doors provide access to the deck that runs right across the front of the cottage. 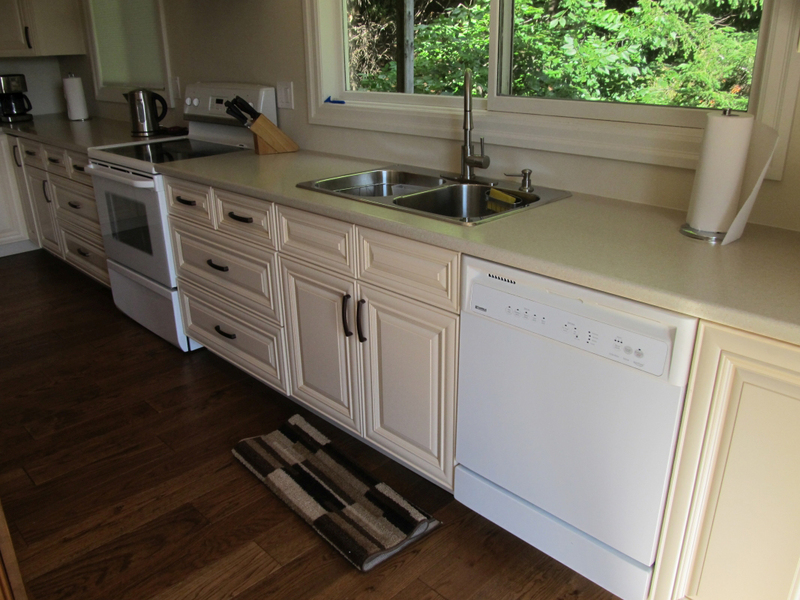 The well-appointed kitchen has a table and six chairs, and an island with six stools. The barbecue is conveniently placed on the deck outside the kitchen. 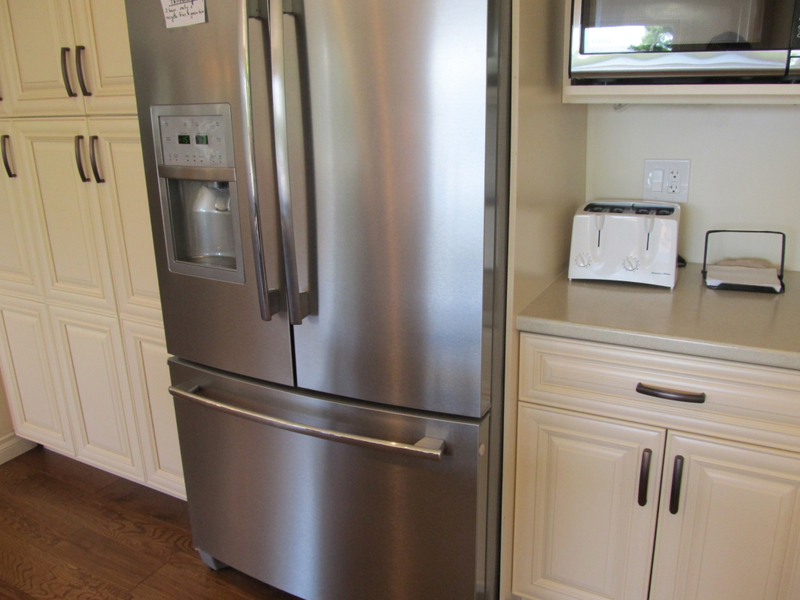 The kitchen and refrigerator water is filtered. 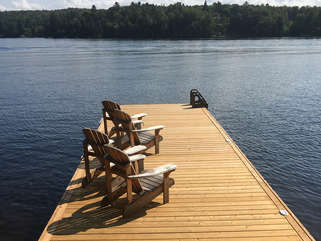 A table, six chairs and umbrella are provided so you can enjoy dining outdoors while enjoying the lake view. In addition, there are four chaise lounges on the deck for relaxing with your morning coffee, or enjoying an evening cocktail. 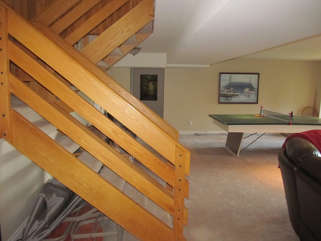 Two of the bedrooms are on the main level. The large master bedroom, at one end facing the lake, has a king size bed. A four-piece bathroom with separate shower is adjacent to the bedroom. At the other end of the main level, is another large bedroom with three single beds, and an adjacent four-piece bathroom. 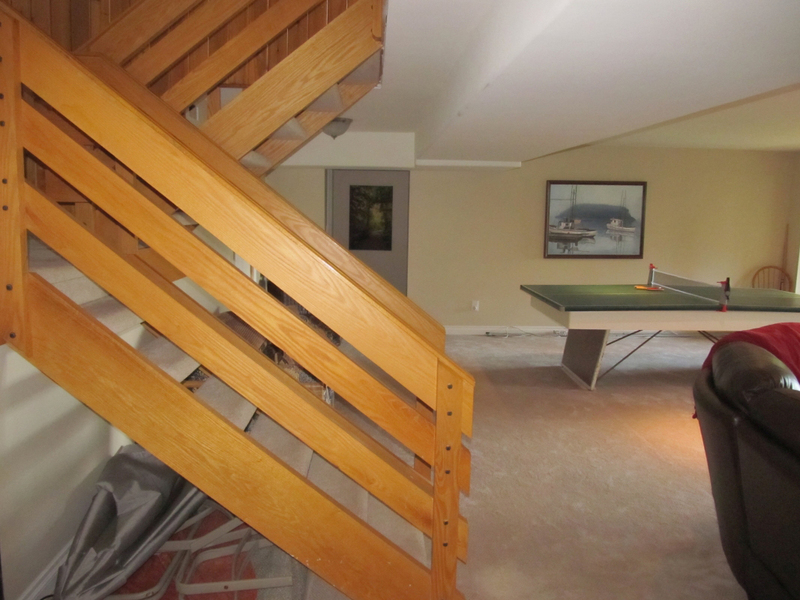 The inviting lower level will quickly become a favourite place for all the family to gather at any time of day, whether to relax, watch television or a movie, or play a game of ping pong. 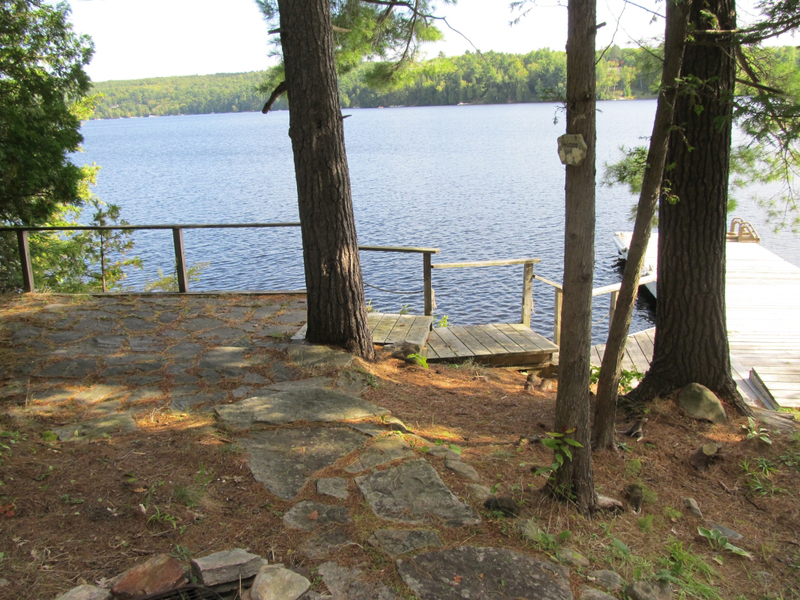 Another deck runs across the front of the cottage on this level. The three additional bedrooms are on this level. 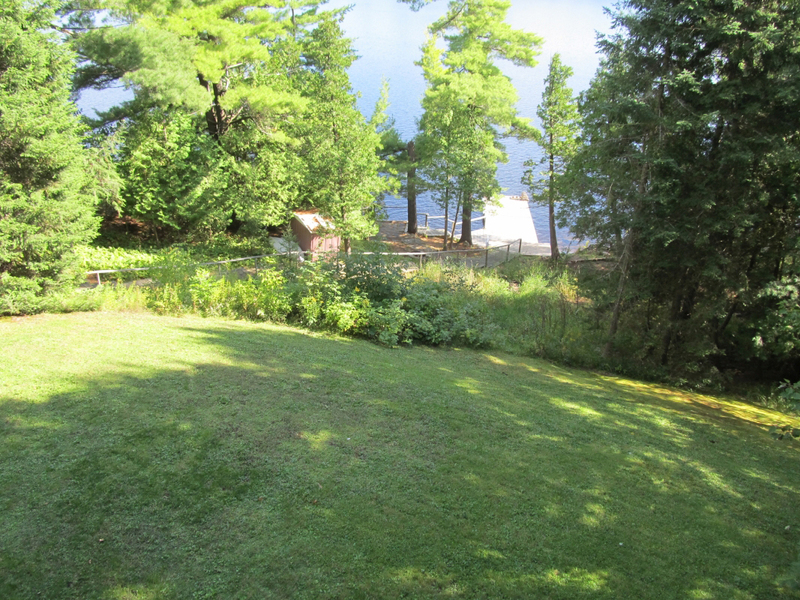 The bedroom facing the lake has a king size bed, and the bedrooms at the other end have queen size beds. There is also a three-piece bathroom on the lower level with a shower that can be used as a steam room. Master ensuite and basement bathroom have heated floors. 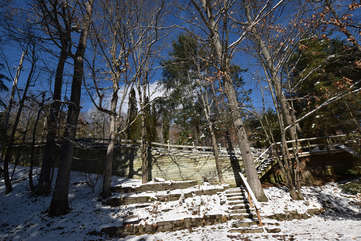 A long gradual staircase of 78 steps leads from the cottage to the waterfront which has been left in its natural state. Near the dock is a patio area with a nice railing and a table, chairs, fire pit, and a hammock nearby under the shade of the trees. 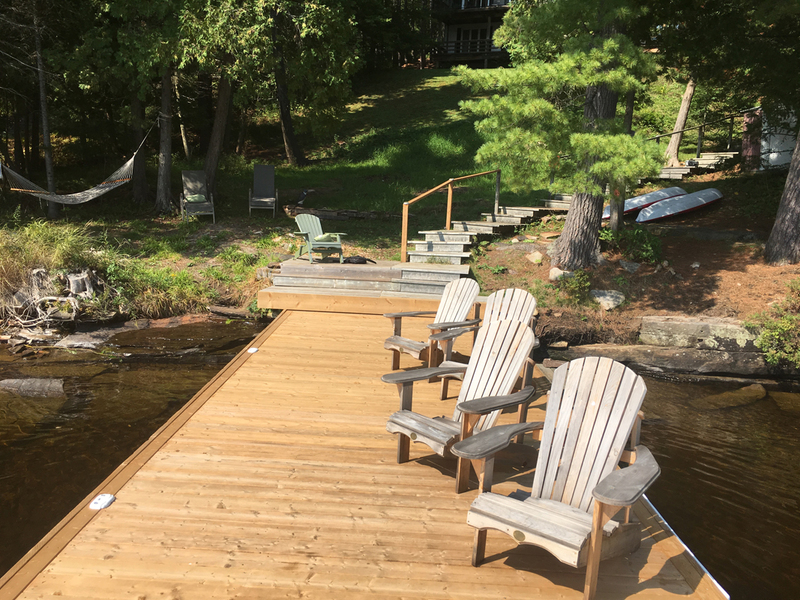 Swimming is best done from the dock, and there is a ladder for getting in and out of the water. Panoramic views of Fairy Lake can be enjoyed from the waterfront. A new dock of 37 feet is great for docking your motor boat. For those who bring a motor boat, there are miles of boating adventures to be had on Fairy Lake and the other three lakes that are part of the very popular four-lake system in the Huntsville area. 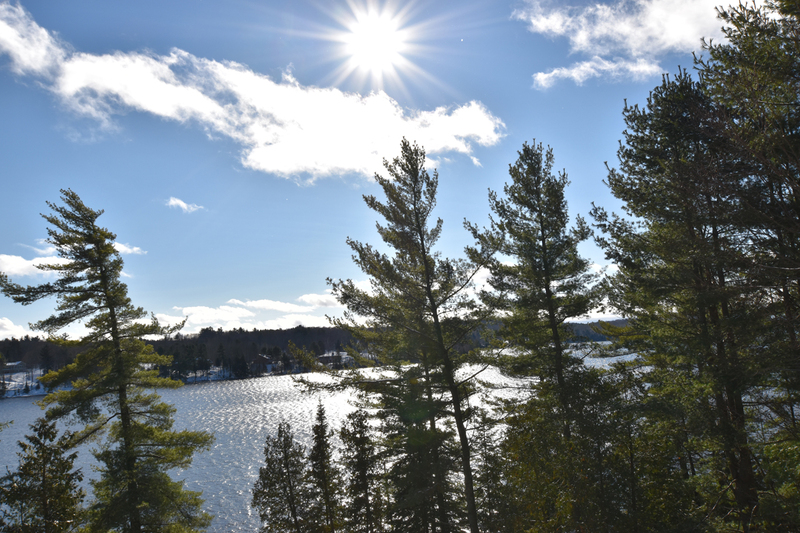 A short boat ride takes you to Deerhurst and Grandview resorts. Boat or drive to Huntsville with its quaint downtown for strolling, shopping, restaurants, live theatre and Pioneer Village. There are numerous premier golf courses in the area. 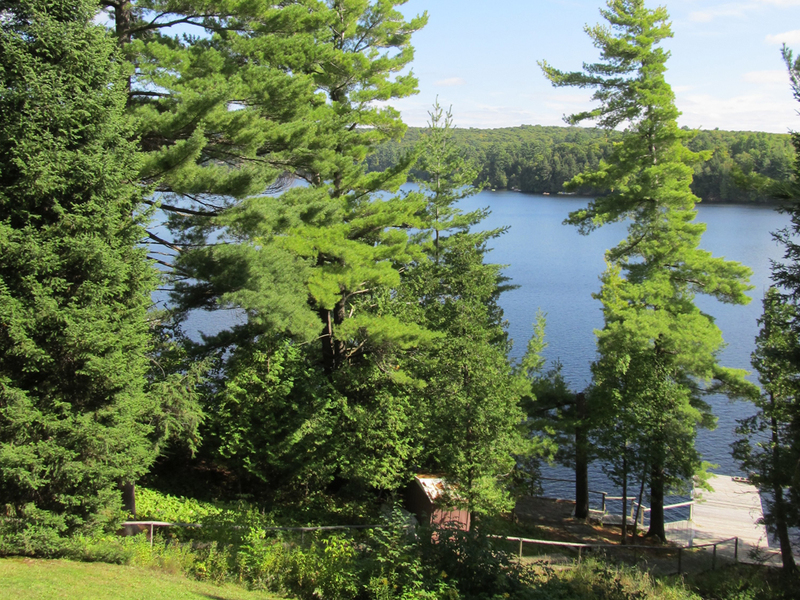 World famous Algonquin Park is only about a thirty minute drive from the cottage. In the winter months, there are activities such as downhill skiing, cross country skiing and snowmobiling. 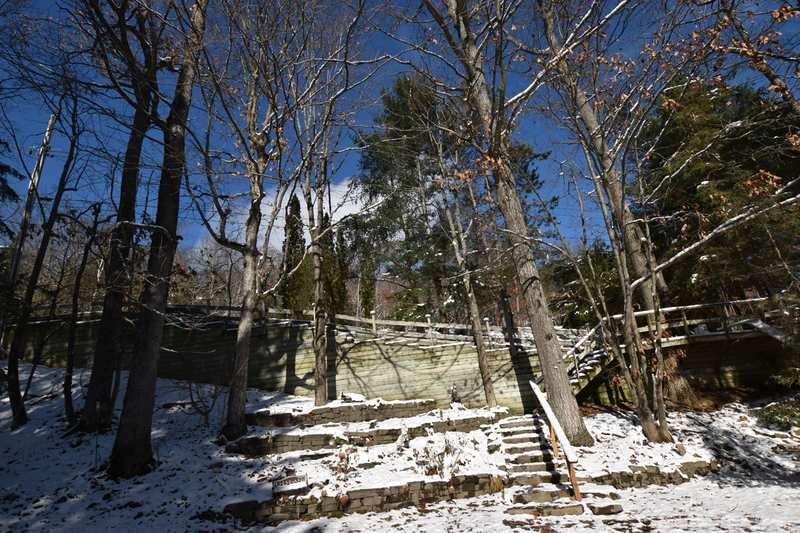 Discover the 1.3 kilometer Ice Trail at Arrowhead Provincial Park on Saturday nights. 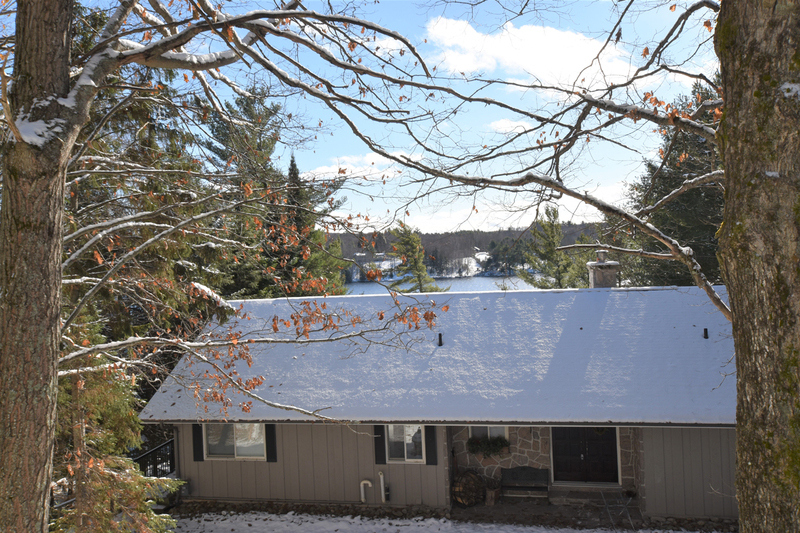 There is only room for two cars in the drive way in the Winter, any cars that park on the road in the winter will get towed if there is snow removal/plow going through. 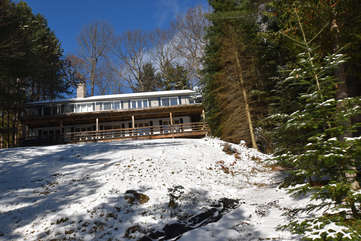 Come and make lasting memories at any time of the year at Fairy Vista cottage. **Vacationers must bring their own life jackets.